A month ago, I inherited 2 indoor basil plants from a friend, who bought them in the produce department of a local grocery store in March. Since I received these plants, the base of the stems have always looked like they are decaying right where the stalk meets the soil in both plants. I know basil stalks turn woody as the plant ages, but I still wonder if it's actually diseased. It looks more like something gnawed at the stem from the side and less like the stem is simply transforming. If it helps, the basil has continued to grow well and I don't notice any other problems, except the occasional dead leaf (in one month, only 2 or 3 leaves have died). What causes the brown parts? Can I fix it? 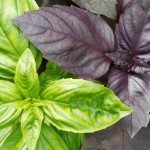 Are my basil plants going to die soon? It sounds like the plant may have a crown rot or a fungus. This happens at that location because it is kept too wet (which likely happened at the store). With proper watering, the condition should stop progressing.